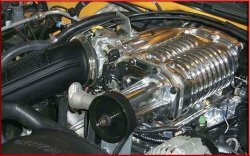 Magnacharger 1999-2003 4.8/5.3/6.0L Truck/SUV Silver Finish [01-12-60-001] : Supercharger Superstore, Your Online Source for Vortech Superchargers, Paxton Superchargers, Procharger Superchargers, Magnacharger Superchargers and Techco Superchargers! Radix Intercooled supercharger system adds up to 120 hp/120 ft. lbs. torque (non-intercooled Radix offers less power). "Internal bypass valve" virtually eliminates parasitic loss...and delivers a proven 30 to 66% increase in real world "under the curve" power. Best of all, it costs less than 1/3 of a horse at 60 mph. Now that's real efficiency.